James L. Crenshaw (Ph.D., Vanderbilt University; D.D., Furman University) is Robert L. Flowers Professor of Old Testament at Duke University Divinity School, Durhan, NC. His Old Testament Wisdom has introduced thousands of students to biblical wisdom, as have his two collections of essays, Urgent Advice and Probing Questions and Prophets, Sages, & Poets. 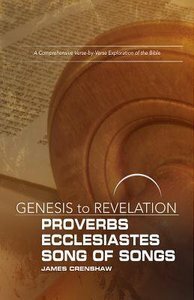 He has written commentaries on Ecclesiastes, Job, Sirach, and Joel, as well as monographs Education in Ancient Israel, Defending God: Biblical Responses to the Problem of Evil, Prophetic Conflict, and A Whirlpool of Torment. Presently, he is writing books on Job and Qoheleth, as well as an analysis of twentieth-century research on wisdom literature for Brill.